We had a great time at the Hickory Nut Gap Farm Holiday Market (December 15th, 2018). Thanks to all who helped make it happen! Just finished and delivered this Octopus painting to ZaPow Gallery for the Tentacles & Intoxication Group Show opening September 2017. Some of the symbolism behind this painting is the dual nature of the feeling of intoxication, which I have often experienced as feeling drunk, but with an impending price to pay in pain the next day. This dual nature is depicted by the background imagery of the clouds of heaven and the flames of hell, as well as the octopus’ “costume” – a halo with horns, angel wings and a devil’s tail. The octopus is dancing wildly, with a different type of beer in each of it’s eight tentacles. The symbolism of the stage with deteriorating wooden slats is left open to interpretation. I also entered a framed digital print of a previous Octopus painting called “Diver Octopus” depicting an octopus partially inside of an abandoned deep sea diving helmet on the ocean floor. Spacekitten Framed Print headed to ZaPow Gallery this week! I’ve started getting into a new medium: Linocut! I think almost everyone who took an art class in high school has done at least one of these. I was really drawn to this medium because I’ve been selling prints of my paintings for a while now, and I like the idea of making my own prints at home, plus I really like the unique qualities that this medium gives to an image. There’s a rustic element and a little bit of chaos involved that makes each print unique. I chose this first image of a windup robot as an experiment to see what comes out of the process, and it’s given me a lot of ideas on what kind of subject matter might lend itself well to this medium. It seems like things with a lot of detail, like woodgrain and dragon scales might be conveyed really well by this type of image making. I’m really looking forward to doing more with this… there’s so many variables involved that can be tweaked, like ink color, paper/substrate choice, pressure, etc. There are some parallels with screen printing that make this medium a lot of fun to work with. I’m interested in developing a multicolor print press so I can achieve good registration with multiple plates. I’ll be taking some of the better prints to sell at ZaPow Gallery! 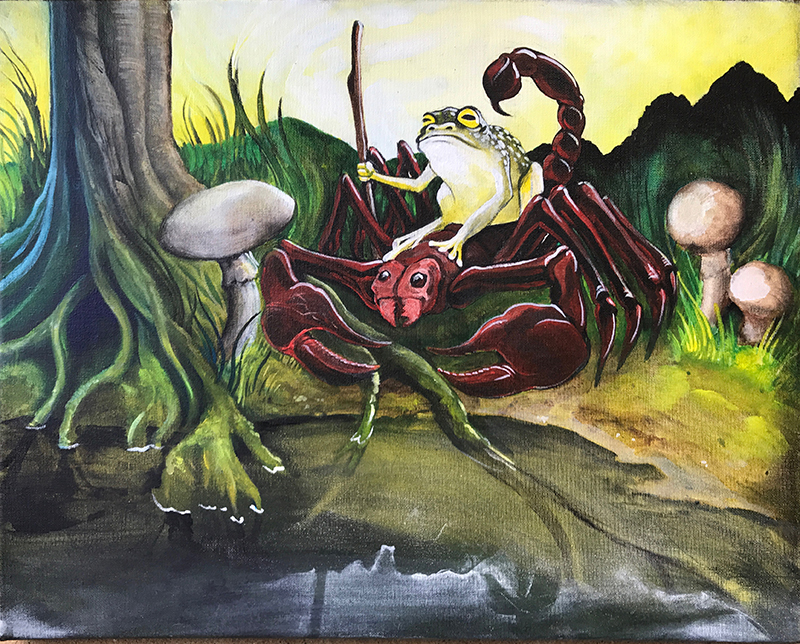 “The Scorpion and the Frog” acrylic on canvas. Come see my painting exhibition at Dripolator Coffeehouse, 221 W State St., Black Mountain, NC 28711. The show will be up during July/August 2017. This is my first event in Black Mountain! 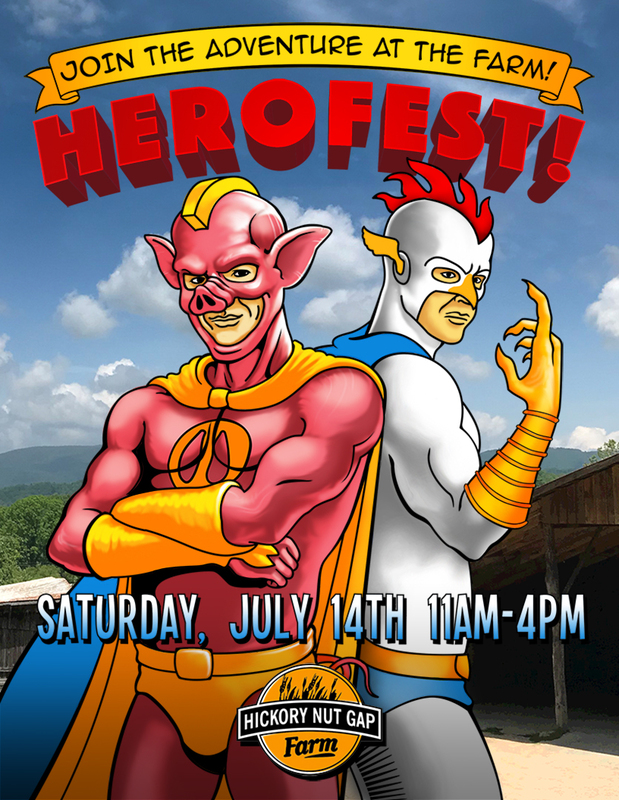 It’s just down the road a bit from our house in Swannanoa. I’m showing a combination of new original paintings on wood panel and canvas, framed prints, and abstract woodblock pieces. The Scorpion and the Frog Fable goes like this: a scorpion asks a frog to carry it across a river. The frog hesitates, afraid of being stung, but the scorpion argues that if it did so, they would both drown. Considering this, the frog agrees, but midway across the river the scorpion does indeed sting the frog, dooming them both. When the frog asks the scorpion why, the scorpion replies that it was in its nature to do so. This painting is the first of a series based on Fables, Myths, and Fairy Tales. I’ve chosen this theme because of how it interweaves subconscious/symbolic dream imagery with natural settings. Fresh from the drawing board! Two tubes of toothpaste battle it out in a 3D “TRON bike” style race to the finish. Bringing science fiction to your bathroom walls! I think people need art to look at while they brush their teeth; I know I do. A new chapter in the ongoing saga of my painting career began today. 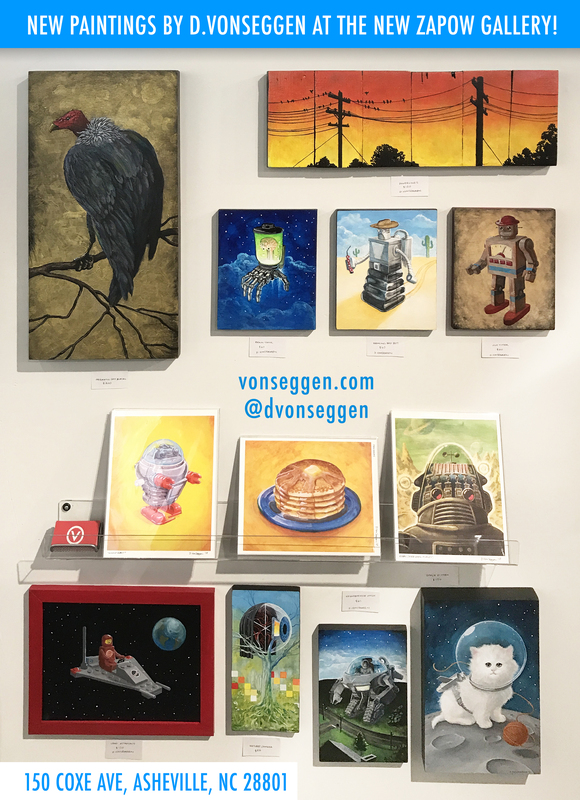 I installed nine original paintings and a shelf featuring digital prints of lots of previous and new paintings! Shortly after moving to Swannanoa last April (2016), I found out about ZaPow Illustration Gallery in Downtown Asheville. After contacting the gallery and sending samples of my work, they agreed to let me show art on a rented wall space beginning in August 2016. I jumped at the chance to be a part of the gallery and painted as much as possible to get ready for my chance to show. August 2016 finally came around and I was able to show; had some sales and was filled with the hope of maybe selling art for a living from the relatively successful start. Then, in October 2016, we got the news that the landlord had drastically raised the rent on the gallery in anticipation of a new hotel being built next door (comments deleted, opinions repressed). Long story short: ZaPow Gallery was going to close down, move, and reopen into a better arrangement for all involved. Today (4.29.17) is symbolic of a lot of things, especially new beginnings. ZaPow Gallery is actually reopening. Art is beginning to fill the walls again, and a community of people is beginning to get together. Events will be attended, ideas will be shared, classes will be held! A lot of potential is being actualized. Exciting times indeed! Official Grand Opening date forthcoming. Stay tuned! Here’s a photo of a work in progress! It’s gone through a lot of drastic changes since I first made the panel, perhaps a decade ago. I’m adopting a painting strategy of “beginning before I’m ready.” I feel like there’s a quantum effect with paintings, when they come together – sometimes after years of sitting in the basement behind stacks of other abandoned paintings. It’s a weird, paradoxical combination of “killing your darlings” and never giving up. 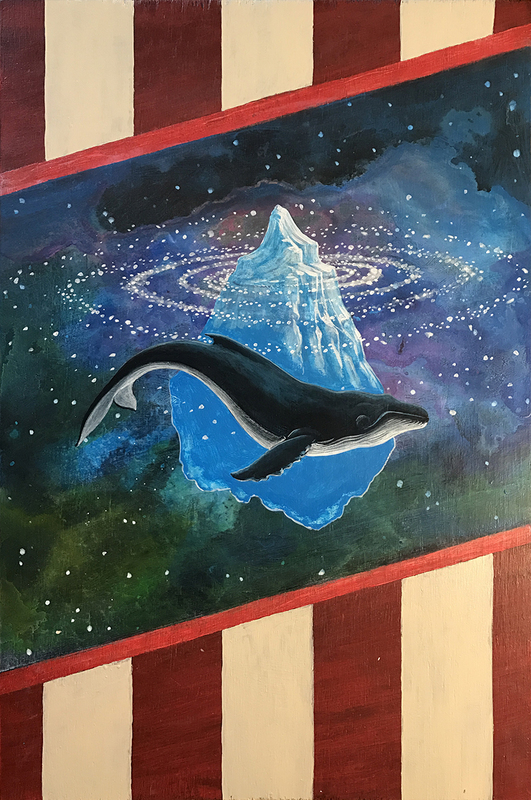 The celestial background was created with a mix of acrylic and watercolor techniques and the reckless abandon of not worrying about the surface having a smooth finish. There’s plenty of brushstrokes layered on top of each other, with the top coat hiding a bunch of previous paintings and random bits of dust and tiny wood particles trapped deep in the finish. The more layers are added, the more it becomes like archaeology. I have some additional features in mind that may change this image drastically. 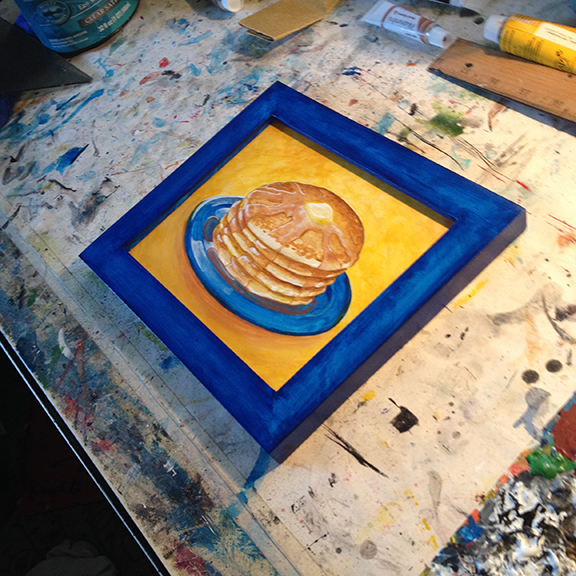 Here’s the pancakes painting with it’s own matching frame!